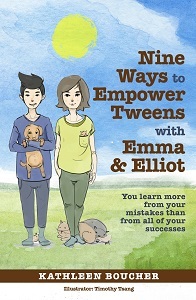 Nine Ways to Empower Tweens with Emma and Elliot is a self-help book oriented towards pre-teens. Told from the point of view of fraternal twin siblings who live in rural Canada, with their many cute and feisty animals, the book touches on many of the anxieties a modern kid starts feeling as they grow older. The advice isn't dulled down, but it remains straight to the point and very relatable. While clearly written for pre-teens and younger teens, a parent may want to read along due to the frequent references to other books and websites that may be of use. They're not inappropriate by any means, but it does make the book a good option to explore with a parent, fostering increased communication. The advice itself is centered on positive thinking, and reflects a lot of what you see with adult-oriented resiliency training. The ideas are very relatable to a tween beginning to realize they're growing up—how to handle fear of the future, how to embrace your dreams, how to learn to face your fears, and so on. Both mental and paper exercises are offered to help with these problems. The narrators are charming and kind, not condescending at all, and the illustrations are very cute. This is a great book to get for kids, especially if they are having issues with teenage anxiety about the future. It makes it clear that their problems are normal and don't have to be overwhelming, all while maintain a sunny and positive yet realistic attitude. Winner of a Silver Recognition Award from Mom's Choice Awards as well as the Silver Award in the 2017 Feathered Quill Book Awards Program for the Best Self-Help Title, Nine Ways to Empower Tweens With Emma and Elliot is a title you need to take some time to explore. Well done! "Every successful person has to start at the beginning. You remember the things you are good at. You hold on to the feeling of being good at something and associate it with the presentation you are about to do." Kathleen Boucher is an award winning children's book author, a certified professional lifestyle coach and a registered nurse. Boucher's mission is to inspire kids to follow their dreams. Nine Ways to Empower Tweens with Emma and Elliot teaches tweens life skills that they can use immediately and for years to come. 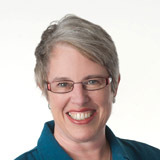 She enjoys keeping her readers updated, on her website www.greatkidsandme.com.